← Georgia Ann Bicknell, M.Ed. 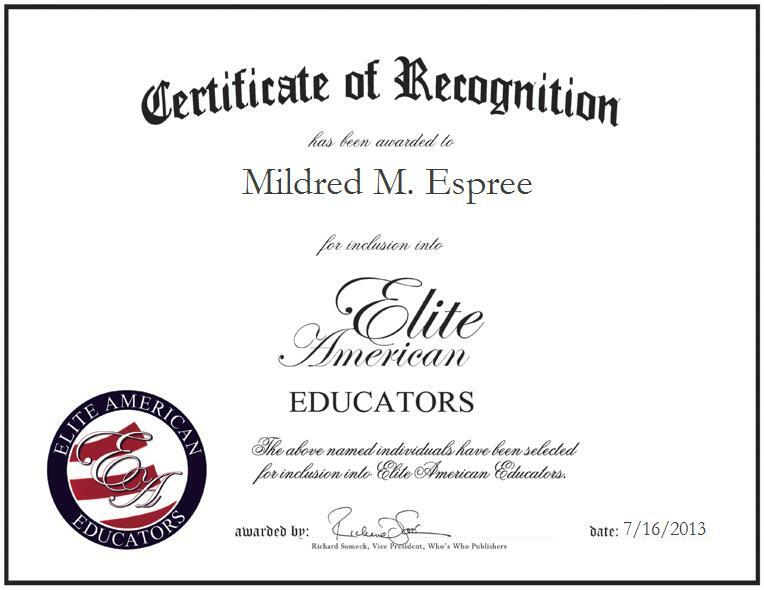 HOUSTON, TX, July 16, 2013, Mildred M. Espree, English Professor at the San Jacinto College North Campus, has been recognized by Elite American Educators for dedication, achievements, and leadership in English instruction. In her current role, Ms. Espree is in charge of teaching English and composition to freshman students at an institute of higher education based in Houston, Texas. She also lectures, teaches online and hybrid classes, and designs curriculum for both classes. Ms. Espree also conducts community outreach. Inspired by her family to pursue a career in education, she followed her dreams of teaching others to learn and grow, as those before her had done in years past. Because she comes from a lineage of three generations of educators, Ms. Espree aspires to carry on a tradition of excellence by helping people to achieve their academic goals. Ms. Espree is a Certified Online Instructor who also completed 39 hours toward Graduate Studies in English and earned her M.Ed. in English Education from the University of Houston. She holds a Bachelor’s Degree in Journalism and English from the University of Texas, as well. Upon reflecting on an illustrious career in academia, Ms. Espree attributes her success to her parents; she was inspired by her mother.